Editor’s note: When we first started out this year, John and I talked about getting Joe in for an interview with Geezer as a look back at Revolution’s 20 year history in kiting. While it has taken some time to get it all together, we think you’ll find this to be a great look, both to the past and the future. My first memory of Joe? He handed me a Rev World Tour T-shirt in 1997 at the World Cup in Long Beach, because the Rev dealer in Canada wasn’t getting any. 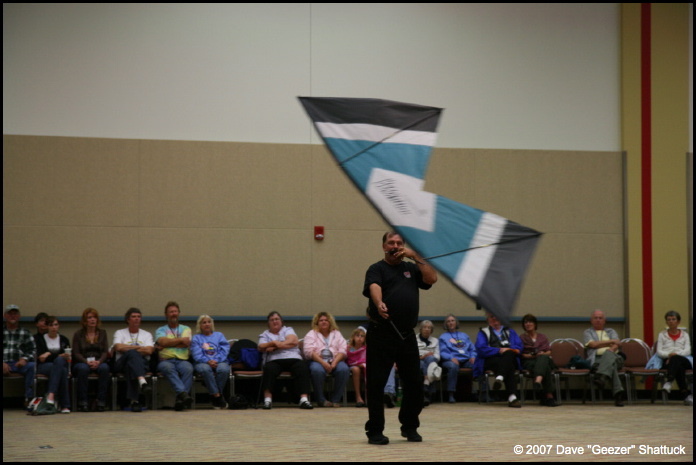 Ever since, I’ve been a loyal Rev fan and in fact, I put together one of the first web sites devoted to quad line kites as a result of that trip. Thanks Joe! Tell us a bit about growing up in a family that’s so heavily involved in kiting now. 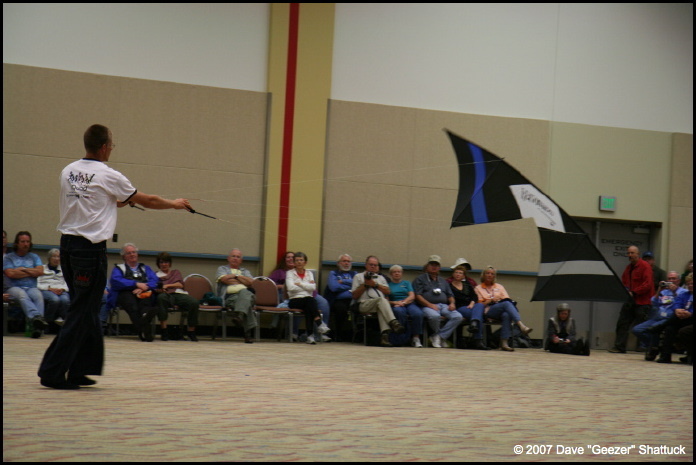 Were you all “kid” kite fliers? When did you fly kites (just on vacations, common summer pastimes, or just occasionally)? Did you buy the kites you flew, or build them yourselves? I have two strong memories of kite flying. When I was around 8 yrs. old, my family (six boys, six girls, six left handers, six right) sat around the dining room table with my aunt, and we built diamond kites out of paper bags, complete with tails made complete with a string of rag cloth bows. It was late in the evening when we finished but I was so excited to test our new creation that I took it out and ran down the middle of the street and flew it under the moon lit sky. The second memory was flying kites at the schoolyard. My favorite kite was a black plastic bat kite with stick-on orange eyes. I would tug on that string hoping I could make it turn and dive, wishing for more control. Since it likely pertains to growing Revolution Enterprises, what did your father do for a living? Was he an entrepreneur, as you have become? Where did you get your start in thinking about “running a business,” and at what age? I always knew since I was a kid that I would have a business of my own. When we were kids, over Christmas break, my brother Jim and I made Christmas wreaths out of trash bags and wire cloths hangers and sold them at the swap meet. I used to build projects in the garage and give them to my family for gifts. One year I built a 7′ palm tree for my sister Lolly. Another time I built a full scale interlocking “Craps” table for my brother Jim. My father was a bartender… that’s probably where I got my ideas for a totally controllable kite (just kidding). When I was very young, my parents owned two resturaunts in New York. That probably sent me on a course to be in business for myself. You eventually went off to college to become an engineer, right? Where did you go to school, and what discipline in engineering really interested you? What were your hopes and dreams that you thought your education would enable? I received my Bachelor of Science degree in Mechanical Engineering from the University of California, Santa Barbara. Since I always loved to create things, I knew early on that engineering was the discipline for me. To earn extra money, I worked with one of the professors in his physics department lab. My main work was on scanning tunneling electron microscopes. At that time the physics world was just beginning to refine microscopes to the point that they could see atoms for the first time! This also had a huge influence on the four line Revolution concept (just kidding). During my senior year, a guest lecturer gave a presentation on car crash equipment he had designed and built for Ford Motor Company. Talking about how “drunks off the street ” were used in the original crash tests, I knew this guy was a rouge maverick of an engineer. I promptly followed him out of the lecture hall and asked for a job. The following Monday I was knee deep in military computer programs, sheet metal retrofits on trailers, stainless steel plumbing for jet engine starters, and vacuum forming plastic fairings for underwater sonar towing. This guy was nuts… and I loved it. But some of the most influential experiences came in the off hours. We would spend hours and hours reverse engineering and building WWII fighter aircraft models from pictures out of books… I mean from scratch!… then we would throw a motor in them and throw them… crash them… rebuild…adjust and throw them again. I developed a certain sense for subtle control of aircraft using control surfaces. Now this truly influenced my later kite designs. Did you start thinking about designing kites as a part of your engineering studies? How did tinkering with strings and fabric and spars come together for you? And if kite development DIDN’T happen in school, what did you do as an engineer before you got into kites, and what brought you out of your job and over to developing kites? One weekend traveling down to San Diego to visit my family, I was stunned to see from the freeway, a large man being pulled across the park by an incredibly powerful kite! (“Top of the Line”) I said to myself, “Now THAT’S what I call a kite!” I spent the weekend building and flying my first delta kites. Since it was a dream of mine to work for myself since I was a little kid, I thought it would be a good time to take some time off to see If I could get something started. Little did I know that this would be the start of Revolution Kites. Were the other members of your family also involved in the R&D that ended up becoming your first production kites? 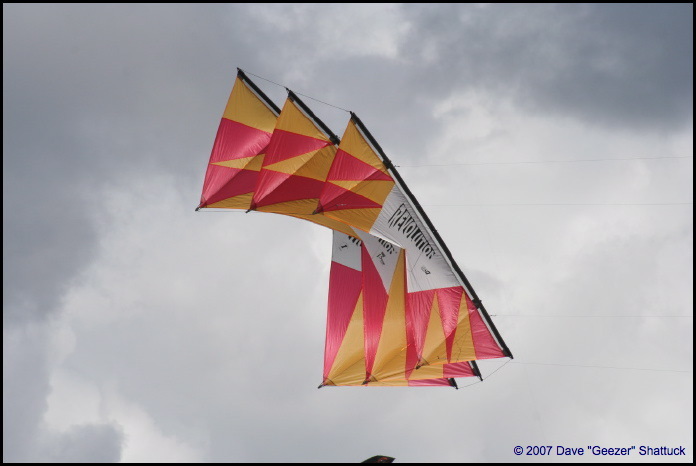 Tell us how the Hadzicki family involvement in kites as a “product” began… How did the original quad-line kite design come about? Both my brothers, Dave and Jim were key to the company. Revolution Kites would have been much less successful, if even possible without them. The actual business structure of the company is virtually Jim’s creation. With a business degree from USC he had the skill set to do the nuts and bolts of the company. Both Jim and Dave spent countless hours test flying. Jim spent a lot of time just flying for fun, where as I was more on a mission. 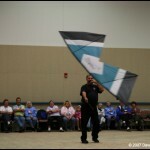 After the company was started, Jim was very successful during the early years incorporating quad line flying into the international competitions including precision, ballet, and team events. From the beginning and through to the present, virtually all quad line events are dominated by the Revolution design. Dave was a registered golf Pro at the time and his connections in the golf industry set up the Graphite R&D with the world’s leading golf shaft manufacturer that, over a six month period developed the bullet-proof Revolution shafts that are the cornerstone of Revolution’s infamous durability. Before the graphite structure was developed, I built the prototypes using “70 series” aluminum arrow shafts. Although this material is stiff enough to use in a Revolution test, it soon bends and becomes useless. A classic difference between building for fun, and building for production. The graphite was critical to our Revolution’s success. This also led to one of our patents in the golf industry for our computer controlled golf shaft machine. In fact, the company that helped developed our original Rev I shaft over 20 years ago, now produces their golf shafts all around the world using our machines. Some other products stemming from our graphite branch of the business include bicycle components, model airplane parts, worldwide sales of our blind cane, military components, and our Revolution Skateboard. Like most great products, it didn’t start out as a business plan, it started as a passion… not only a passion for kites but a passion to accomplish, a personal challenge to see if you can break the mold. I’ve always felt that you blaze a new trail not by reading about it or asking others about their experiences, but by experiencing it personally and creating your own vision. For me that really comes from physically getting my hands and mind on it and in it. To feel my way through the experience. I’ve noticed over the years a quirk in myself concerning things that I deeply want to understand. I really don’t want previous ideas or perceptions explained to me because that viewpoint will now influence what I see. If I’m trying to do something differently than has ever been done before, then why look at it through old glasses? It’s a real catch 22, but it works for me. I look at it like a treasure hunt. I know the treasure is here. If I can turn over the right rock, or approach the problem in a way that no one has tried, I might find a treasure that others have over looked. And the ultimate reward, for example, is to stand on the beach for that magical moment and to revel in the realization that you are the first and only person in the history of the world to experience this new invention that you created. For me, this is what it is all about. In short this is my passion in life. After playing with Deltas for a few weeks, flying, stacking, team flying with my brothers, I felt a need for more control. I tried various wing shapes, adding more control lines, and even hinged control surfaces, and even though I was having some limited success, it wasn’t what I was looking for. My vision was a kite that you could stop at any point in the sky, and then back down with total control, and land…like the Harrier Jump Jet. That was my vision, and I’m big on visions. That’s what drives my passion. After several months of experimenting (build the kite in the morning, fly it in the afternoon, wrestle with the results that evening, and come up with design changes for the next day’s attempt), I had hit a wall. I had run out of ideas. Then one day by chance, I was on the phone with my old boss in Santa Barbara tying up some paper work on an old project, and although our conversation had nothing to do with engineering or design, it some how changed my state of mind. The next morning I opened my eyes and sat up in bed and said to myself, “That’s it! I need two independently controllable wings, just like an airplane! This was the “AHA!” moment that changed everything. The concept worked on the first prototype… two squares of fabric separated by an empty space. From then on it was the daily routine of building in the morning, flying in the afternoon, and re-designing in the evening for the next day’s build. All right, you now have a kite design that you’re playing with. How did that coalesce into a prototype production kite, and how did that – in turn – become the original Neos Omega kite? And while you’re at it, please tell us where that original name came from. At this point I felt the hard work was done… we had made the leap to a conceptually new design. Radically different than the current trends. But now we had a new kind of challenge before us. Now we needed a kite that could be reproduced efficiently. A kite that was durable and easy to assemble. (our durability test consisted of flying from the back of a truck at thirty miles an hour. When the kite hits the asphalt at a hundred miles an hour, and all you break is a bungee cord, you know it’s ready). A kite that would be accepted by the public on all levels… cost, quality and performance. The graphite was expensive. Spectra flying line was expensive, and we needed twice as much as deltas. Stainless steel handles were expensive. And patenting a product was expensive. During the next year we cleaned up the design, streamlined production, developed our graphite structure, filed for a patent, and started our company. It didn’t exactly happen like that. 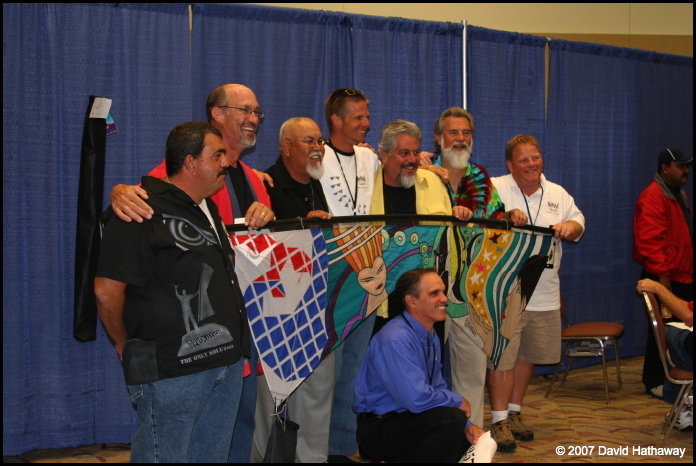 We took eighty kites to the international kite trade show in San Diego in 1989. The Revolution design was an instant show stopper at the convention, selling out in the first hour followed with orders for 400 more! We had a wall of people, three deep for three days placing orders. On Saturday, the kite demonstration day, we had store retailers crowded around with three to six kites under their arms waiting for a lesson. With this information, they would be able to go back to their stores and amaze all their customers, therefore selling thousands of kites! ….. Wrong! We gave people the basic lesson, telling them, thumbs back flies the kite up, left thumb forward turns left, right thumb turns right. Both thumbs forward, backs the kite down. The fact that this method of flying was completely alien to them (no pulling motions), along with the highly sensitive controllability, made the Revolution overwhelming. Add the fact that we had virtually no experience teaching people to fly added to the confusion. It seemed so easy to us! 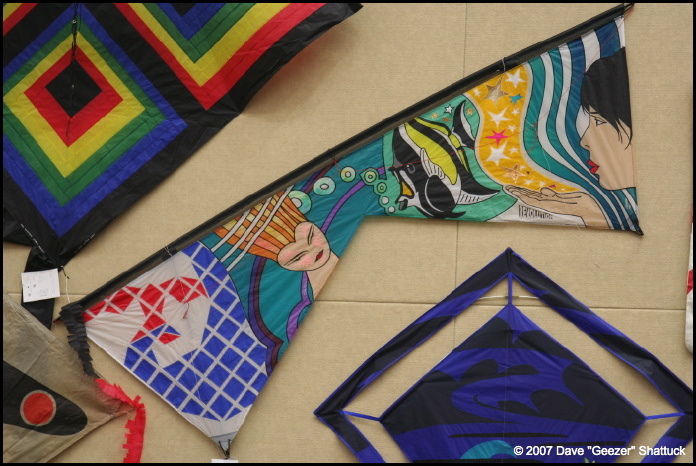 Although selling the kites complete with a training video was the original plan, it had been dropped due to advice from store retailers that the cost would be prohibitive. After a couple months of frustration from new Revolution fliers and retailers, we began including the training videos with each Revolution sold. 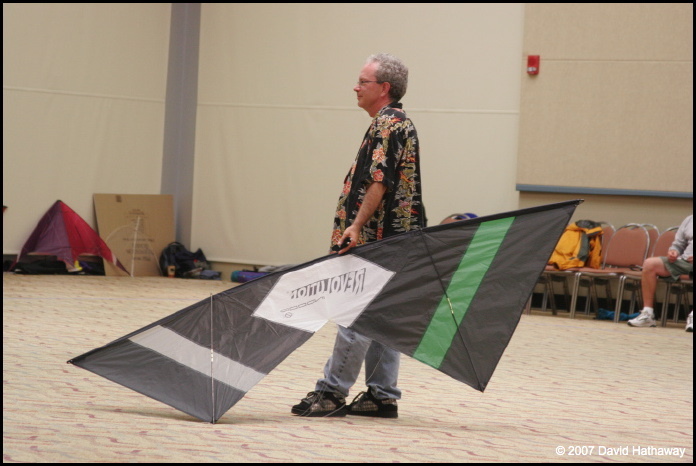 (this was the first time in history for stunt kites to come complete with training videos!). We instantly noticed the difference! New fliers that used to take two weeks to get the basics would now buy the Revolution, watch the training video that night, and learn the basic flying skills by the next day! So for us the challenge in those early days was not in gaining acceptance or marketing as much as meeting demand. Things were completely crazy at our “headquarters” (AKA our parent’s garage). We enlisted everyone we knew to help us with production. We managed to get a golf club manufacturer to make our shafts, and a sail company to sell us rip-stop material and to provide us with sewers. We did all the kite assembly, packaging, and shipping ourselves. 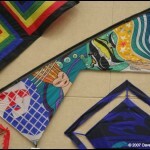 As we sold more kites, we were able to hire people to work for us and to rent a production facility. I think my mom and dad were a bit sad to see us go as they worked with us in the shop for many years after we moved. My dad made a lot of handles! And one of the things that occurred fairly quickly is that kid on the East Coast kind of took a liking to your product! How and when did Lee Sedgwick first get involved with Revolution, and how did Lee’s efforts help Revolution evolve? We first heard about Lee Sedgwick when we read about an upcoming kite event in San Francisco, sometime in 1989 before we went into production. We heard that someone was going to fly a four line kite in the innovative event. Oh, No! Had someone already taken our idea? We bought three tickets to San Francisco to check it out. The day before the event we went up into the foothills of San Francisco to test our kite in high wind (must have been blowing 50 mph… see our original store demo) conditions. The day of the competition we anxiously waited as Lee came out and flew in an innovative four line demonstration on thirty foot lines connected to his delta and tied to individual fingers on each hand. The demonstration was amazing, but luckily it had nothing in common with our Revolution design. After the demonstration, we went up to the emcee, Corey Jensen, and told him we had invented a radical type of kite and asked if he would like to see it. He basically told us not to bother him, he was too busy at the moment. To this day he still laughingly tells this story. So we didn’t approach Lee that day either. Later, Fran Gramkowski picked up a Revolution at the original ’89 trade show promising he would have Lee review it for us. About a week after the trade show, Lee called us up and gave us a bunch of suggestions. About a week later, he called us back and told us to forget everything he told us to change… the kite was perfect the way it was. He was always a great supporter of ours and gave a lot of valuable feedback. In fact, Lee has his own signature kite. 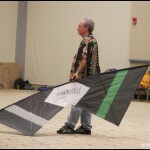 He flew Revolutions at nearly every kite event and we’re grateful that he has been a friend from almost the beginning. Then there was that young fellow from the Bay area who wanted to put appliquéd Patrick Nagle paintings on Revolution kite sails – Randy Tom! I understand what prompted him to want to use a Rev for his “canvas.” The real questions are, when did this occur, what did Revolution get out of this, and why did Revolution and Randy stop making them? Randy is one of the greatest guys you’ll ever meet in kiting or for that matter, anywhere. 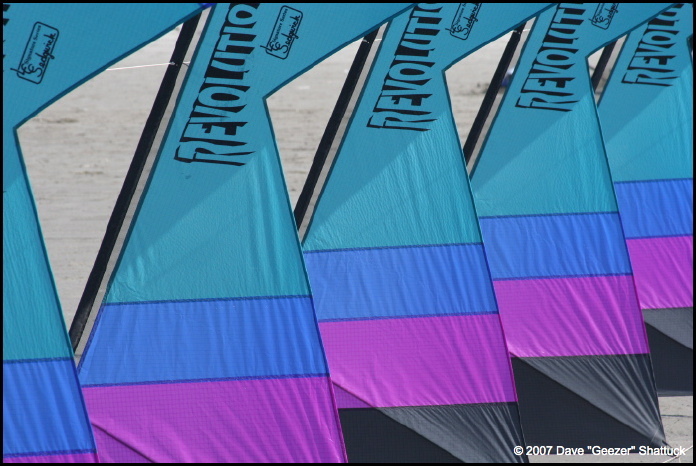 Randy’s “Nagle” Revolutions were really the original “masterpiece series.” We were honored that he wanted to use our kites as a canvas. I think we stopped making them because they were very elaborate and time-consuming for Randy. Randy still finds time to do really special projects for us including the latest masterpiece series. I have one of his custom “Carnival series” Rev 1.5’s hanging in my office, and no Ben, you can’t sell it to anybody! Anyway, after a couple of years of “survival,” you also have multiple “stock” products available, such as the Rev II and various kite “weights” (light, standard, vented, etc. ), and even other product lines. You produced a Dodd-designed dual-line kite for a year or two, did you not? And you also produced the Back-Tracker for a while. I don’t want to dwell heavily on “loss leaders,” but it’s almost inevitable that every company has a few hidden away… So what did Rev learn from these marginal efforts, and how did they go toward improving the more successful product lines? We worked closely with “the Kite Loft in Ocean City Maryland, and one night over dinner we brainstormed the idea of a quality mid-sized delta custom built for The Kite Loft with our signature graphite structure. A couple months later we had a prototype, but the store’s focus was shifting away from high end deltas. We felt we had something to offer. Later that year the opportunity came up to work with Dodd, and so we put together the “Phase II” with the help of Dodd’s delta design expertise. The kite actually sold well. We just didn’t have the personnel to support the necessary marketing. As for the Back-Tracker, we were influenced by stores wanting a product at a lower price point. To do this we designed a kite that we thought could be easily produced overseas. However the quality control issues far outweighed any savings that we might have passed on to consumers. So the lesson we learned is that our reputation for quality and service was more important to us than trying to produce a product over which we had little personal oversight. That means you might pay a bit more for a Revolution product, but we stand behind it because we have actually made it. And somewhere along the way, you also developed the Indoor Revolution kite. 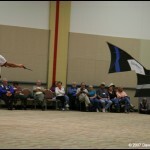 What prompted you to develop a kite specifically for indoor flying, and how does it differ from the other Revolution kites? Can you talk a little bit about the reasons for the specific differences in sail designs for the Indoor Revs? And early on, you also made a transition from Revolution buying ready-made spars to making your own. That had to be NO small undertaking. Tell us a bit about the reasons for that transition and what it’s meant to the company. Well, a couple days before the debut of the Revolution at the 1989 KTAI convention in San Diego, our shaft developer and sole supplier informed us that they were too busy with golf industry orders and wouldn’t be able to supply our shafts any longer. They almost put us out of business before we even got started. Strangely enough there just happened to be a graphite manufacturers’ convention in San Diego the following week. We parked ourselves outside the convention and during a break, we launched our kites and put on a demonstration for the attendees. A few of them came over to talk with us and we soon had a new supplier. After about a year we had supply problems again. That’s when we decided we would get into graphite. The engineer that led the original development of our shaft felt sorry for dropping us on short notice, and offered to help us get started. We quickly got tired of the tedious hand rolling techniques, but were unimpressed with the current machine technology used in the golf industry. We began developing our own machines. Over the next four years we designed, developed and patented our new design for graphite shaft fabrication. Our machines are currently used throughout the world making tens of thousands of shafts each day. No, it wasn’t easy, but you know what they say, “If you want a job done right, just do it yourself”. It wasn’t so much what we saw in the market. We’re always asking ourselves if we can do it completely different than anyone else… even if that “anyone else” is us! You gotta admit, the original Revolution design is pretty good, so how do you make it different? The first thing that comes to my mind is SPEED. Make it faster. 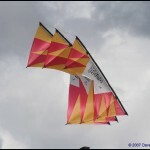 To increase the speed, the kite is designed more as a rigid wing than a soft kite. The flat, knife-like surface has almost no drag compared to a foil, and the single surface gives you huge, almost instant power. When you combine this design with the standard Revolution control system, you have incredible speed and power control along with the classic Revolution precision. Then, we need to know what the story is behind Lee Sedgwick’s “other” kite, the nimble little UFO! How did Revolution’s involvement with the UFO come about, and how is the UFO doing in your stable of products? Talking about thinking outside the box, Lee has really done that with this kite. Lee has been perfecting this kite for years, and when he came to us to help out with the production and distribution of his design, we knew we finally had a chance to return all the support he has shown us. People love the unlimited possibilities of this kite and we’re proud to be a part of it. A couple of years ago, you brought on Ben D’Antonio as Rev’s new General Manager. Kite fliers appreciate Ben because he’s out-and-about in the kiting community, marketing your products. So from your standpoint, what is Ben doing for Revolution, and how do you see Ben’s efforts contributing in Revolution’s future? One of the things Ben has instituted is his “Masterpiece” program, where he’s worked with outstanding kite artists to hand-produce custom one-of-a-kind kites. From our viewpoint, these kites have been a marvelous addition to the Revolution stable. From a kiting event standpoint, it’s the most valuable asset to have a knowledgeable flyer, in every respect, out on the field promoting kiting to the public. And Ben is the best we’ve ever seen. Meanwhile, the Europeans had been playing with “Team-Flying” Revolutions for a more than a few years. Groups like “The Decorators” and “Flic” and several other teams have raised a few eyebrows over time, but it wasn’t until a few dual-line comp pilots got together on a windy day in Ocean Shores that iQuad was born in this country. 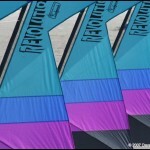 What has iQuad done for the sport of Quad-Line kite-flying, and for their primary sponsor, Revolution? iQuad is a big piece of the big picture of getting kites out there. Not just to the kite flying audience, but to the general public at large. iQuad’s unrelenting World traveling tour from across the United States to Canada, Japan to Europe later this year, is raising the world’s awareness of kiting like no other group in history. Finally, Kitelife’s HEARTIEST Congratulations on a solid twenty years of Revolution! So here’s your chance to offer some thoughts on what Revolution’s future will bring. We’ll understand if you don’t want to talk specifically about new products or innovations, but we’d like any thoughts or views you care to share on where you hope to take Revolution in the future. Our big plan… are you ready… is to keep doing what we’re doing. Keep building the best kite possible, and most importantly, keep growing kiting around the World … oh ya, and keep hunting for the best treasure of all… the new design that no one has ever seen before! This entry was posted in 2008, Interviews, Issue 61 (Jul/Aug), KL Archive and tagged Hadzicki, interview, rev, revolution.